Crowdschool is a project-based learning platform for both teachers & students. Crowdschool's platform tested poorly in usability, and was aesthetically outdated. To redesign the current platform's usability based on user testing, and to do an initial pass on a UI update. For the presentation of this project, I will be focusing on the teacher's view of the "Projects" section of the platform. (or scroll down to watch a video of the walkthrough). 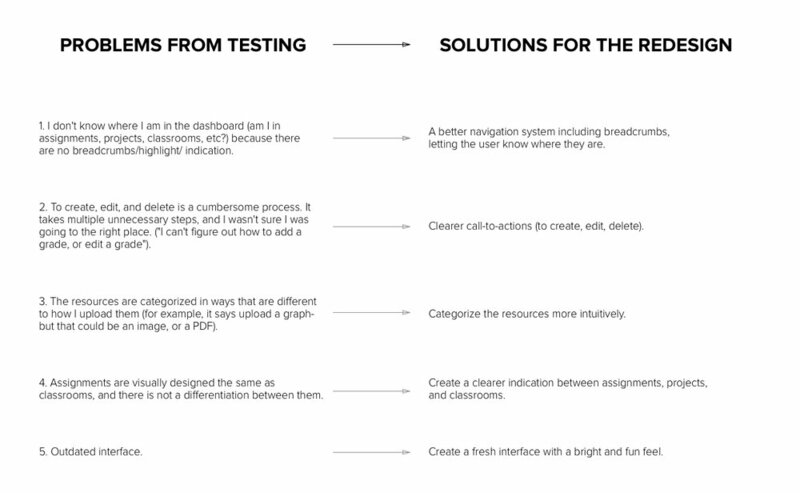 Crowdschool's designs tested poorly in UI & Usability, and my goal was to change that. After user testing the previous designs, I came up with solutions to make the redesign more intuitive & user friendly. The site needed a design for Persona A; the teacher, and persona B; the student. For the sake of keeping this to a minimum, I will focus on Persona A, the teacher, and the "projects" section. 1. I want to have the ability to create a project overview that is easily editable. 2. I want to add resources for my students that can include articles, videos, presentations, graphs, etc. (with easy option to edit, delete). 3. I want to add specific assignments per each project (with easy option to edit, delete). 4. I want to grade students on each assignment per project, and have an overall average score (with an easy option to edit, delete). 5. I want to easily be able to jump from resources, to assignments, to grading-- and know where I am without any confusion. 6. I want to share a project with (1) a classroom, or (2) more than one classroom. 7. I want to have a view of all my projects, and easily jump to and from individual projects. I tested the top two designs on 10 different users to see which one was more intuitive and user friendly. 1. Users felt Design A felt emptier than B. 2. They liked the idea that all the content in B was in front of them / Content felt more connected in one place. 3. It was easy & intuitive to jump to different sections in B. - Open the project titled "Under the Sea"
2. Existing Project; "Under the Sea"
With more time, I'd test this product on an actual classroom (the teacher & it's students) over a period of time, where a few projects could be created & interacted with. I'd want to make sure that we aren't any missing any relevant possible features, and validate that it made teaching & learning a great experience.